The England star was lining up 10 days after an independent disciplinary panel upheld a Rugby Football Union charge of “conduct prejudicial to the interests of the game” against him. Gloucester Rugby's Danny Cipriani celebrates at the end of the Gallagher Premiership match at Kingsholm Stadium. 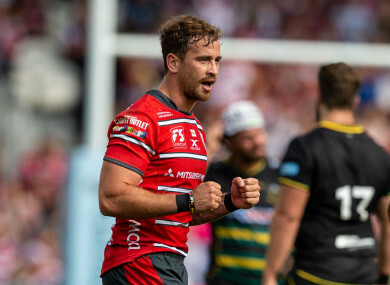 GLOUCESTER CENTRE HENRY Trinder saluted troubled Danny Cipriani after the England fly-half inspired a 27-16 victory over Northampton on Saturday. Cipriani delivered a man of the match display in front of England boss Eddie Jones as he created a first-half try for wing Charlie Sharples on his first Premiership appearance since leaving Wasps. Cipriani was lining up 10 days after an independent disciplinary panel upheld a Rugby Football Union charge of “conduct prejudicial to the interests of the game” against him. That hearing followed his conviction last month for common assault and resisting arrest after an incident at a hotel bar during a Gloucester training camp in Jersey. But if Jones required a reminder of Cipriani’s rugby ability, he will have left the west country with a spring in his step. “He is a quality player, as everyone knows,” Trinder said after his side’s success on the opening weekend of the English Premiership. “Obviously, he has got a lot of history and people have their ifs and buts about him, but he has come in here 100 percent focused to win something and push this team forward, and he has got class to unleash the guys on the outside. Exeter overcame a sluggish start to get their season under way in style with a 40-6 defeat of Leicester at Sandy Park. Sam Simmonds, Luke Cowan-Dickie, Henry Slade, Matt Kvesic, Ian Whitten and Olly Woodburn scored Exeter’s tries with Gareth Steenson converting five. George Ford replied with two penalties for Leicester. Ben Tapuai’s try brace sealed Harlequins’ 51-23 bonus-point win over Sale. Tapuai capped his Quins debut with a double as wing Nathan Earle also touched down on his club bow, with Joe Marchant, Marcus Smith and Max Crumpton rounding off the six-try victory. Young England playmaker Smith racked up 26 points, under-lining the 19-year-old’s promise. AJ MacGinty bagged a try in an 18-point haul for Sale. Wasps edged to a 21-20 win at Worcester Warriors. Email “'Quality' Danny Cipriani hailed after Premiership masterclass”. Feedback on “'Quality' Danny Cipriani hailed after Premiership masterclass”.